A music-obsessed getaway driver is blackmailed into helping commit an armed robbery but his conscience puts him at odds with the rest of his crew. Baby Driver is a post-modern heist movie from writer-director Edgar Wright, best known for his work with Simon Pegg on Shaun Of The Dead and Hot Fuzz. In fact the film has a similar vibe to their amusing parody of the American action film and the way he cleverly choreographs the onscreen action to the brilliant soundtrack works really well. But where The Cornetto trilogy films felt like a complete experience, there seems to be a fundamental ingredient missing that would have given it the necessary weight and texture to become a truly great film; it's like a musical without the songs, or a comedy without the jokes, or a crime thriller without the grittiness. It is certainly an entertaining experience but its comic strip approach feels more smart Alec than smart which is summed up perfectly by the scene in which Jon Bernthal tries to relieve him of his sunglasses. 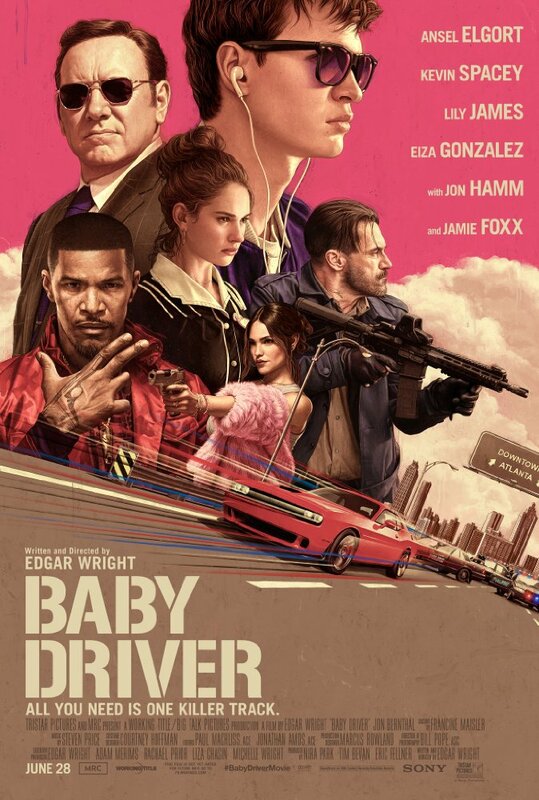 As a whole I quite enjoyed Baby Driver, but it's an open and shut case of style over substance.